Bijou - A gem of a little salon in Skaneateles: Bijou salon in skaneateles turns one today!!!! Hip hip hoooray!! Bijou salon in skaneateles turns one today!!!! Hip hip hoooray!! I've got your full attention now, don't I?! 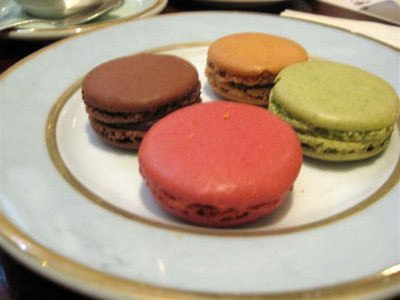 You want to know, what is with all the macarons, and what the heck are macarons anyway?? 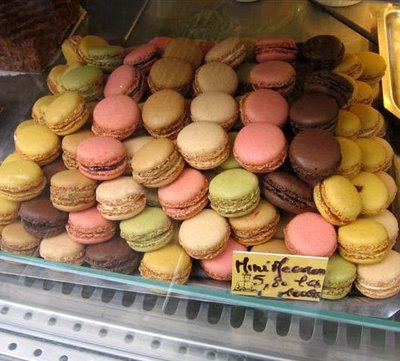 Have I been to Paris to eat these famous Macarons?? Nope, but I've read so much about them, that I sometimes dream about them in my sleep! 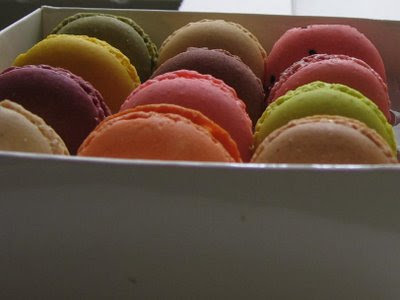 I mean really, they are beautiful, bright, colorful little treats. When I tend to dream about things, they eventually happen, I'm lucky like that:) I mentioned my obsession to my dear dear friend, the one who makes such wonderful cakes. She informed my that she could make those, I was shocked, down right shocked! I knew she was talented, but were talking...making something I've only seen in magazines or on the Internet...apparently they are relatively (heh, heh) easy (heh, heh, heh) to make. They are almond meringue (droool) and ganache or various fillings. So to celebrate my 1 year anniversary of Bijou salon in Skaneateles....I would like to share these little gem of treats with everyone that stops into Bijou during the month of September!! 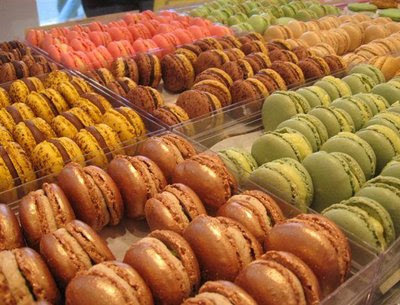 I am so grateful for every ones support and this is the least I could do...share some macarons!!! ( I only hope that I can keep my lovely girls from scarfing them down, okay and fine, as well as myself;) wink wink! I would also like to mention as our way of saying a big grateful thank you...For the first half of the month (so, until the 15Th of September) anyone and everyone, man, women or child;) we are offering free eyebrow waxing or lip waxing. So if you have not had the luxury of trying it, come on in and let us work our magic! It will be our pleasure...our next little treat for the 2ND half of the month (starting on the 16Th - 31st) we will be offering free upgrades on our pedicures to the SPA PEDICURE!! Our hot towel cabi is just begging to be used!! Coming soon will be our single use paraffin mitts, no more dipping into a large communal bath of paraffin wax, you will get your very own mitt that you can dispose of after you are done! Winter is coming and this will be perfect for those dry skin days! Thank you everyone who has helped spread the word about Bijou, we are all so grateful to you and are so happy to be able to share our little gem with you! Thank you for the kind comments and affirmation, that Skaneateles needed a gem of a little salon, like we dreamt of! Thank you to my parents for giving me such warmth as a child, that I have been able to pass on to others, always taking care of elderly friends gave me such compassion that I cannot thank you enough. Thank you for telling me you think I could do this (even when you don't think I can drive from NY to IL all by myself) If you would have said you thought it as a terrible idea, I would have probably not done it. Thank you for believing in me. Thank you to Thomas, my wonderful better half who believes me 100% and with such conviction, I could never doubt myself. You took out the equation that worried me the most, the books...I could not survive without your dedication, waking up early every Sunday to do the week long book work for the salon. Thank you for everything you do, I cannot thank you enough or list all the things you bring into our lives! Thank you to my little (okay, fine little and one high schooler;) boys, you made this all so easy, you are the most patient little guys in the world, you sweep up for me, you run my errands and you never complain about spending too much time at Bijou. You guys are champs and my greatest source of pride! Thank you to Gloria from Angels by the lake and all the angels inside of 6 Jordan street. You gave my dream a space a real live space, instead of just in my head (it was getting so crowded in there and I kept changing my theme too much;) You are the best! Thank you to Chris Gary for making me look my excuses in the eyes and tell them to get on with it, call about the place and take hold of my dreams and have no regrets!! You pushed me, I needed that, I'm grateful for that, you are a great business women, I am so thankful I have you as a sounding board! Shelly Kennedy, my virtual decorator and cherished friend. How many times had we done a salon in our head. You kept me focused and kept me on task. It could have never turned out so unique and wonderful without your magic touch. You made it all so easy, we just pointed and picked and didn't stress, it just happened like magic. You are magic! Dina Sakal and Dee Vounas, my two Greek goddesses. You both are my big sisters that I dreamt of, you are always there to support with me with your ears and advice, I am so blessed to have such strong women as friends! I love you both and Thank you for all the help throughout the year with the boys and dinners and making sure we all don't work toooo hard. Joe and Tom, Thank you for the beautiful floors, and for helping us pack up everything and lend a hand in moving:) You guys are true friends! Thank you to Ros Schwartz and Betty Congel for entertaining Thomas while he was working all alone at the shop during construction, and thank you for all these years of telling me I should follow my dreams. Your faith in my means the world! And last but not least (and I'm sorry for those of you I might have missed, but this could go on for days, if I don't let my brain rest:) Thank you to my strong girls at Bijou! Kimberlee, thank you for believing me when I said you would be successful in this town, thank you for being you, thank you for your wit and somewhat dry sense of humor that has me cracking up all the time...thank you for your loyalty and thank you for taking the chance at Bijou, I knew you would be an immediate success, you're awesome! To Jackie, thank you for reading about Bijou in the newspaper and peeking through the windows and getting all excited about there finally being a salon worth your while in this town, I'm so honored to have your expertise and knowledge and I adore your professionalism! To Michele for adding such a colorful spark to Bijou, for singing out loud to yourself (and talking to yourself:) and for taking such gentle care with some of your elderly clients, thanks for your extended hours and coming to work with such zest after a long day at the hospital, you do great work and make people feel good about themselves! To Connie, for feeding me more and more knowledge about Young Living oils and for being such a source of info for all of us what will we do, thanks for hopping so eloquently right into your position and joining in the fun we have, you add so much to Bijou and have been such a wonderful spirit to work with, we hope to see you next year and will miss you dearly when you return to TN. To Courtney "June", you are a go getter and have wonderful people skills, you always throw in extra hours and help everyone, your team work is so appreciated and we are so glad to have you with us at Bijou! To my longtime friend Lori, who I have worked so harmoniously with for many years, thank you for asking that fateful question that day, telling me that I didn't need to answer right away, that I could think about it, I knew my answer the moment you asked me! I'm so happy to have you hear, with your expertise and precision styling and awesome updo's. It is my privilege to have you with our team, you completed a great team for me, you added that last little puzzle we were missing, thank you for transitioning so gracefully and adding so much to the Bijou team! And to Rachel, our newest part time girl, just graduating from beauty school, with so much other accomplishments, licensed massage therapist, licensed esthetician and now licensed cosmetologist. I know you will do great and you will bring us so much knowledge and ideas. We are glad to be able to assist you in training and look forward to getting to know you! Gee, I am so sorry this turned into such a long post, however when it comes out onto the computer from my fingers typing, it must be said, I could not delete:) Hopefully some of you will make it to the end, so that I can say..."Now stop reading and come on down to Bijou at 6 Jordan Street for some delicious Parisienne Macarons!!!" I wish you continued success and many more years of YOU making us all look so darn pretty! Happy birthday to you, Happy birthday to Bijou! What a gem I have found, I just moved to town and enjoyed a luxurious afternoon. 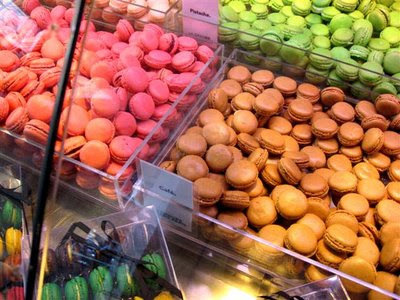 AND a macaron or two or three! Congrats on your success Kim and the staff at Bijou, you all work so hard at keeping things neat and tidy, its a real pleasure every time!